Discussion in 'Model S' started by brantse, Feb 1, 2016. Reading that another owner (techmaven) mentioned that Firestone does a lifetime wheel alignment, I thought now is as good a time as ever to purchase this. I happen to have a Firestone close by, so ran over there to confirm that they could do an MS (the website included it in the vehicle selection menu). When I asked about the possibility to do alignments on a Tesla, I got a blank stare from the woman at the counter and a resounding "NO" from the two individuals in the back (shop supervisor and technician??). They said that I would have to go to a "dealer" to have that done, as it requires "special tools". I probed a bit to understand if there was really any merit into what they were telling me, but mainly to try to understand what reason they have to completely turn me away. They really had nothing else to share, just that they don't have the tools to do it. I would say with confidence that I'm the first person to ever ask this particular shop if they can do a Tesla, so this wouldn't likely have been something that they checked on before. If there are physical reasons that their machine is not compatible with a MS, that's perfectly fine, I just didn't get that feeling or that they could really answer that without more information. Have others had more luck at other Firestones or know if this is pretty common. FWIW, the Firestone shop is probably the only tire shop in my area that I would expect to have a modern/advanced enough alignment machine to do a MS. The user islandbayy has a lifetime alignment with Firestone so I think they're full of it. Many shops are afraid of "different", if they haven't worked on it before, they don't even want to try. doesn't matter how simple it is. I used to drive a right hand drive vehicle, it was extremely easy to work on, but it was extremely difficult to find anyone willing to do so, even something as simple as buying new tires turned in to a huge hassle. I even had a windshield chip repair place refuse to fill a chip because they said they wouldn't be able to drive it in to their shop! It's just human nature I guess, but it's quite frustrating when you run in to it. If they haven't done it before, would YOU want them to do it? It's a car, there's nothing that special about it in the wheel alignment category. They already do this on hundreds, possibly thousands of other different make/model/year combinations. If you would trust them to work on other makes and models, why not this one? That is a consideration but you should also consider that they Tesla does not have some oddball exotic suspension. It's a standard suspension and any competent shop should be able to put it on the machine, punch in the code for Tesla and adjust the alignment. It's possible they don't want the liability. I won't take mine to just any Firestone. I have had issues in the past with my ICE vehicles, but the particular shop by me does a great job for alignments. Would I trust them to Change my Model S's oil? Thats a Big Negative. The tesla is no different than any other car with respect to alignment. I have lifetime alignment with Firestone on all my cars. Besides Firestone, anyone had any luck with other shops such as Goodyear etc.? I have a pretty good Goodyear store which I had a lifetime alignment on my ICE, and they have done all other tire related work without issues. I also have a small local mechanic which does a phenomenal job on my other cars. I guess as long as they were comfortable lifting it without damaging the undercarriage, the alignment should be easy for the most part. HI I am in Bayarea CA and I called in two firestone and they both stated they DO NOT do Alignment on tesla At-least the one in Brentwood CA and another being in Antioch CA. Does anyone know any Firestone Which does wheel alignment on Tesla in the bay area ? I was trying to add to lifetime. Because The closest service center to me is about 80 miles back and forth not a big deal but still just wanted to add the lifetime alignment since its at such a good price. I know in the past some of the Firestone stores have done alignments on Tesla in other states was wondering if any one of them is in CA in the bay area does it? I am in Corinth, Texas (By Dallas) and I could not even get Firestone to swap out my wheels. The "Master" technician was afraid to work on it. I mean they were already mounted and just need to be swapped. Needless to say they would not align it either. Removing wheels on a Tesla is a far bigger deal than a simple alignment given that you have to worry about not damaging the battery. Why do you say that? There are jack pads on all four corners. Really easy to see and really no different than any other car. You jack up a unibody car without using the jack points and you will damage it too. I have swapped out the wheels on my old S plenty of times in my garage with nothing but a jack, stands and a torque wrench. It's cake. Anybody who calls themselves a mechanic and refuses to do wheels/tires or an alignment is just scared to work on it. Those are jack points, not pads. You need a proper pad to insert or you risk damaging the battery because the lift point, the ones that you point out, are about 1 inch higher than the actual battery. Very few shop lifts can lift on just those points without overlapping onto the battery which is a lot lower. Some use hocky pucks which is ok. 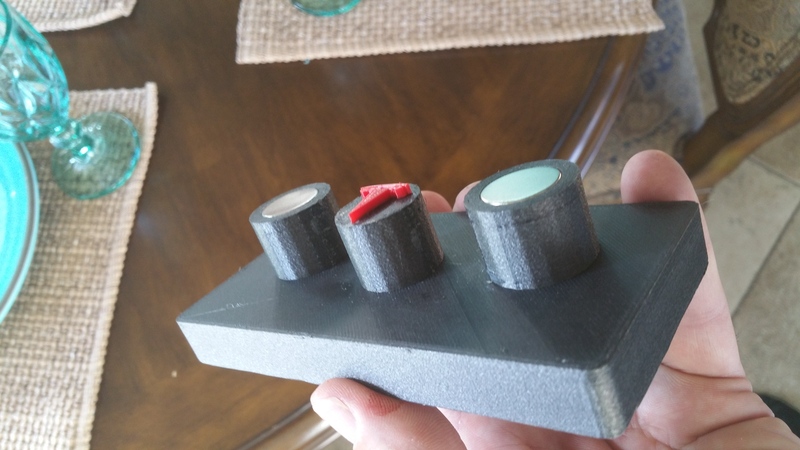 I myself have printed some using carbon fiber with magnets that hold on to the bolts in the two holes.